Ah, the flip phone era. Boy bands topped the charts, Outkast kept things fresh and clean, and Destiny’s Child were still together and wearing whimsical outfits designed by Tina Knowles. This glorious decade spanning 1996 to 2006 comes to life once a month at Honey’s underground dance party in Northeast, an LGBTQ-friendly event that will bust you out of your usual night-at-the-bar rut. 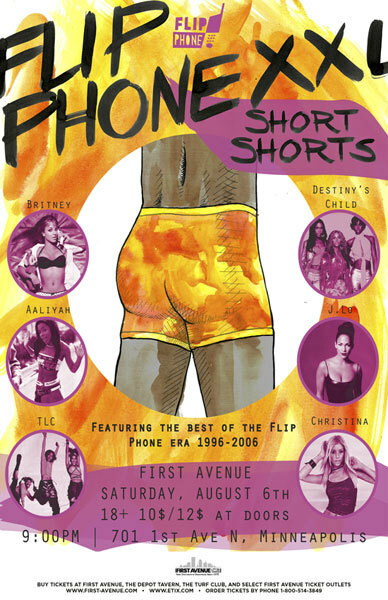 This Saturday they go all out for Flip Phone XXL Short Shorts in the Mainroom. We interviewed the the DJs of Flip Phone asking all the essentials re: 90s/00s pop culture. Flip Phone: Old song: “Break It Off” w/Sean Paul- Pour me a glass of Mountain Dew + Spiced Rum and I am transported back to hitting the dance floor in ‘06. New Song-ish: “We Found Love” w/Calvin Harris- Perhaps one of this decades best pop songs. You can’t listen to it without moving. Flip Phone: Old Song: Toxic: Perhaps one of the best pop songs of last decade. Toxic never wears out its welcome. New Song: Till The World Ends Remix with Ke$ha, Nicki Minaj. Pure perfection and pop bliss. Flip Phone: Bring it Back? Never my thing, but if it brings joy (or mild excitement) for some people, why not? Flip Phone: Bring it Back! I think Ariana Grande is the right candidate for the job.